Happy National S’Mores Day! To me, nothing says summer like s’mores. Whenever I go to the lake, or have a BBQ, I always buy the fixin’s for s’mores. There’s just something about them that says summer. I make lots of variations on the sweet treat. This year, I’ve made ice cream and pudding based on s’mores. 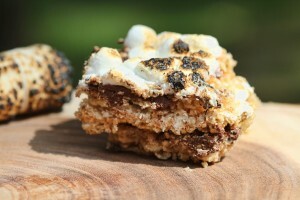 My favorite so far has been these s’more rice krispy treats. These treats are mega messy, just like the original, but mega delicious. They have all the great components of a s’more with the toasted marshmallow, the crunch of the graham cracker and that sweet chocolate bite. Yum. 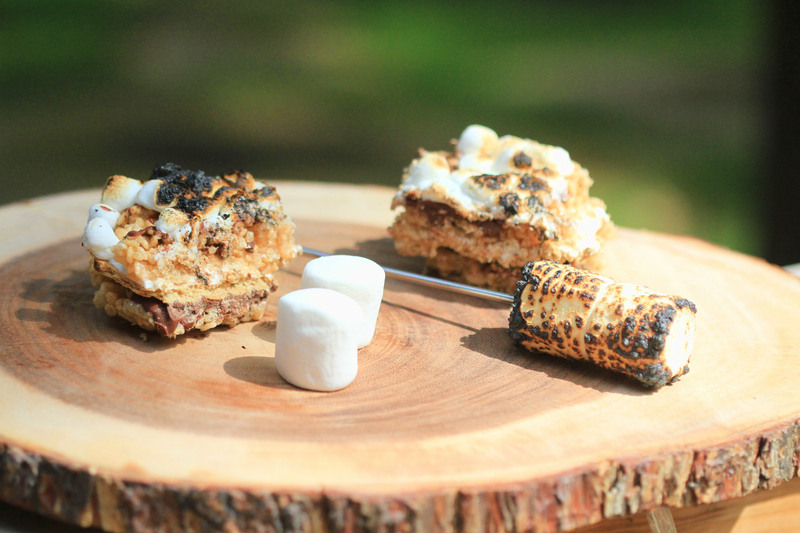 Celebrate S’more Day by digging in! This recipe is adapted from Iowa Girl Eats. Delicious take on traditional Rice Krispie treats. Before starting, make sure all your ingredients are readily accessible. 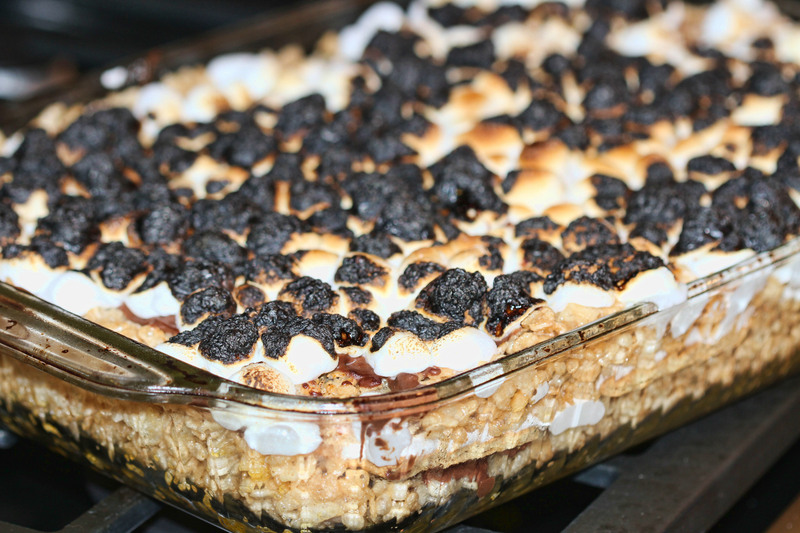 This recipes comes together quick, because you want to work before the Krispie treats solidify. I laid everything out near my stove. Spray a 8 by 8 inch casserole with butter flavored spray. Put chocolate in a microwave 30 seconds, then stir. Repeat until melted. Now we'll make the Krispie treats. Read the rest of the recipe before you start, because after this point, time is essential. I'm sure you've made Krispie treats before. If you haven't, you first melt the butter in a big saucepan (big enough for your Rice Krispies). After it's melted, add the marshmallows and stir them until they melt. Add your Krispy treats and stir until coated. Use half the rice krispie treats to make a layer on the bottom of your 6 by 6 casserole. Make sure the layer is pretty solid with no gaps. Quickly spread about half the chocolate over that layer. The chocolate layer doesn't have to be even. I just drizzled it around. Spread about half a jar of marshmallow fluff over the chocolate. Layer the broken graham crackers, in a single layer, over the fluff. Top with the rest of the rice Krispie treats. Again, try to make a solid layer. Drizzle the rest of the chocolate over the top. Top with an extra handful of so of mini-marshmallows. You can torch these if you have a propane torch, for a more authentic look. If you don't have a torch, place them under the broiler for a few minutes. Let these layer cool, and slice (you can put them in the fridge).